I've been working on a custom Bluetooth speaker for a while and I recently upgraded the amplifier and battery in it. I started out with a limefuel USB battery and a hand-wired audio circuit based around a TDA1517P which was 12 volts and required a boost converter. That was fine, but it was not loud enough for me, so I upgraded to a 25 watt amplifier chip from amazon and I also upgraded to a 12 volt SLA battery. I'm still using the same Bluetooth adapter, which is an Esinkin W29-ESK001. The adapter requires 5 volts, and it worked perfectly fine with no issues on the USB battery. However, now that I'm using a 12 volt battery I have to use some sort of regulator circuit. I wired up a LM7805 according to many circuit diagrams I found on the internet and it was outputting 5 volts just fine. I connected it to the Bluetooth adapter and attempted to play some music. There was quite a bit of high pitched beeps when connecting to the adapter, and when I started playing music there was many more of the same thing. It almost sounds like you can hear the Bluetooth chip processing the audio signal. I assumed the LM7805 was just too noisy, which I then looked up, and it turns out linear voltage regulators are actually quieter than switching power supplies, but I went ahead and ordered a buck converter anyways to see if that would solve it. Still no luck with that once I got it wired in; I was hearing the same exact beeps/blips I was hearing before. Now I'm at a loss as to what to try. I've seen some mentions of ground loop isolation, but I'm inclined to believe that's not the problem as the setup worked perfectly fine with the USB battery. I'm under the assumption that the SLA battery is introducing noise into the power for the Bluetooth adapter, and that I might need some sort of filtering, but I'm certainly not an electrical engineer and I don't own an oscilloscope so I can't really test that theory. I know that the amplifier isn't creating the noise because if I plug the 3.5 mm jack straight into my phone it's crystal clear. 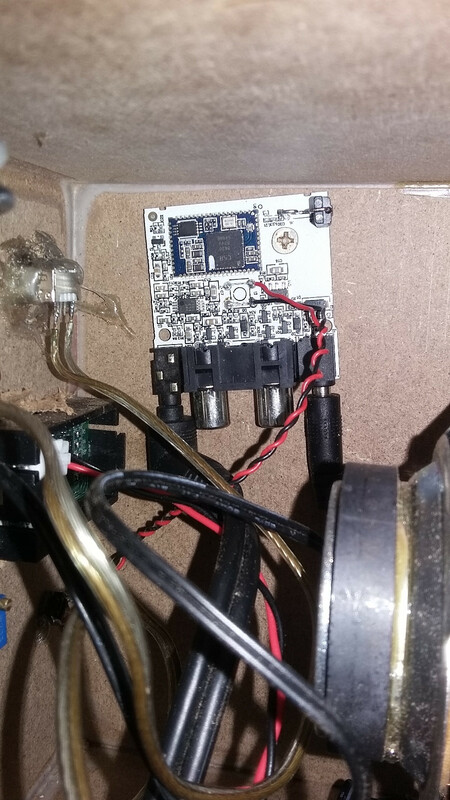 I assume I need maybe a low pass or high pass filter to put on the 5 volt line going to the Bluetooth adapter, but I'd thought I'd ask the community what they thought before I wasted my time with that. Any suggestions as to what I should try? Thanks! EDIT: Added some images of the setup. Not pictured is the battery, because it would get in the way as there's not much space in my enclosure. The battery is an Expert Power EXP1270. Also not pictured is my amplifier chip. I tried to add the picture but Stack Exchange informed me that I do not have enough reputation. It turns out that Bruce was correct when he said he suspected I have a ground loop in my circuitry. 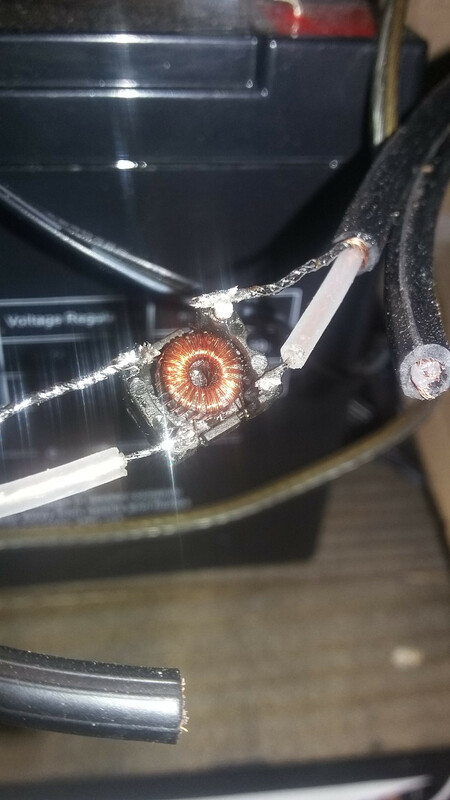 I did some research on the concept, and the way to prevent a ground loop is to have some form of isolation. In the case of audio (and many other applications) that can be accomplished through a 1:1 isolation transformer. This Wikipedia article has some good information of what an isolation transformer is. I read this article and it was stated in the article that dial-up modems have 1:1 isolation transformers built in. I didn't have a dial-up modem but I did have a DSL modem, and inside was indeed an isolation transformer. I desoldered it and added it inline to the wires carrying the audio signal from my Bluetooth adapter to the audio amplifier and the annoying beeps/blips were completely gone. This is indeed the correct solution to the problem I was having. The reason this works is because analog audio signals are indeed alternating current, not direct current, and the audio signal can therefor be transferred over through the transformer due to electromagnetic induction without the wires physically touching and causing a ground loop. If the audio signal was direct current (as is the case in digital audio), it would not be able to pass through the transformer (though at some point, the audio signal must be converted to analog in order to vibrate a speaker's cone and audibly hear it). Below I've attached a photo of what the transformer looks like added into the circuit. The way it's attached is temporary. 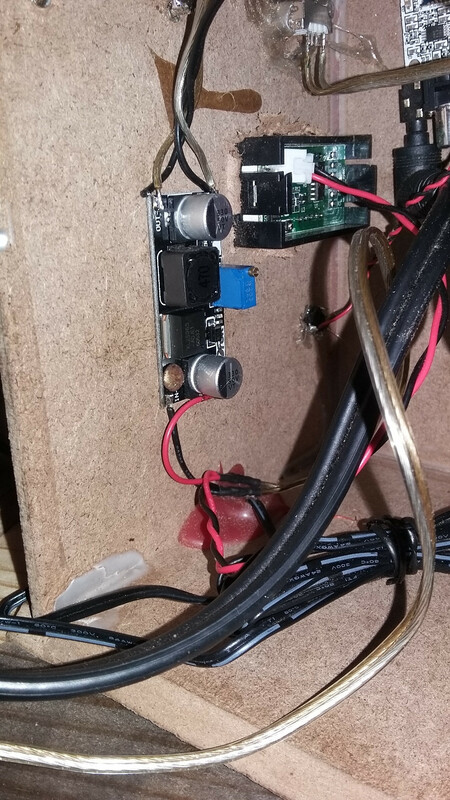 My solution was a bit more DIY, however ground loop isolators are available commercially for those interested. Not the answer you're looking for? Browse other questions tagged audio noise bluetooth or ask your own question.